“In search of stiffness-tunable materials that help increase the load capacity of soft robotic systems without sacrificing their compliance during robot-object interaction, thermally activated shape memory polymers (SMPs) stand out as a promising candidate. Not only are SMPs capable of reversibly changing stiffness by two to three orders of magnitude, they are also compatible with 3D printing. However, thus far it has been reported that SMP-based soft actuators generally suffer from limitations such as slow responses, small deformations and difficulties in automated fabrications with microfeatures. 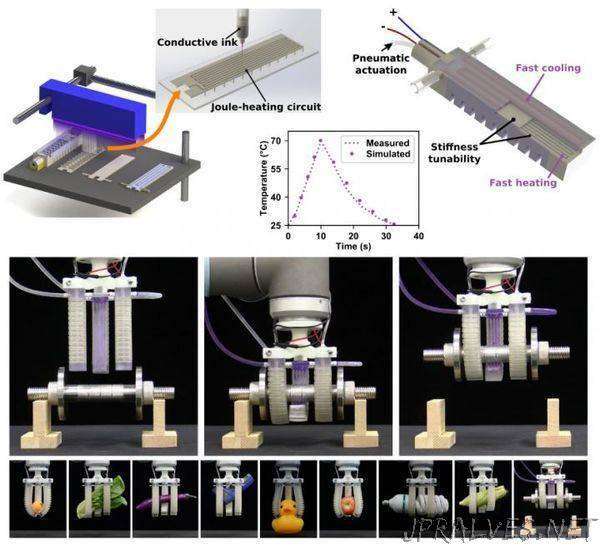 Researchers from the Singapore University of Technology and Design (SUTD) and Shanghai Jiao Tong University (SJTU) recently proposed a paradigm to use finite-element simulations and hybrid multimaterial 3D printing to design and manufacture fast-response, stiffness-tunable (FRST) soft actuators which are able to complete a softening-stiffening cycle within 32 seconds. In fact, the integration of the SMP layer into the actuator body enhances its stiffness by up to 120 times without sacrificing flexibility and adaptivity. A deformable conductive circuit printed with a silver nanoparticle ink activates the rubbery state of the SMP by localized Joule-heating. Upon deforming the actuator with pressurised air, the SMP is cooled down with coolant driven through a fluidic channel to lock the geometry. “The deformed actuator in its stiff state can perform load-carrying tasks, even after releasing the pressurised air. More importantly, a heating-cooling cycle can be completed within about half a minute, which is the fastest rate reported, to our knowledge,” said Professor Ge.